Jewish Quarter of the Old City of Jerusalem – Found at Israel Tours. Rachel Silverstein found the Torah stifling. She’d been born and raised in Crown Heights, the home of the followers of the Rebbe in Brooklyn, and when she was twenty, she took a sabbatical to study in Israel. “But Rabbi, our traditions and practices are so primitive. I don’t understand why a woman can’t be a Rabbi, or daven wearing tefillin and a tallit. Didn’t Hashem create us all, men and woman in His image? 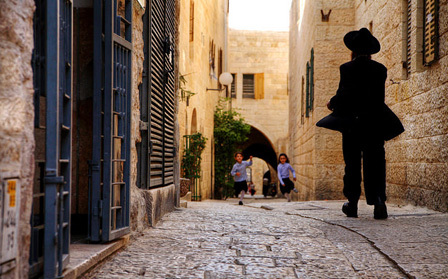 Rachel and Rabbi Bergman were walking together in the Jewish quarter of the Old City on a pleasant spring afternoon on a Thursday discussing her struggles with being an observant Jew. The Rabbi was kind and patient, but Rachel would have appreciated more if she paid attention to how she was treating him. He feared she was already far too assimilated into secular culture to continue her studies. She paused for a moment thinking he’d be mad, explode, lose his temper. Was he just going to let her go? “I understand.” On the surface, the Rabbi’s mood hadn’t seemed to shift, but beneath, he was heartbroken. Another Jew seduced away from her people. What Hitler’s Holocaust couldn’t accomplish, assimilation and secularization would. More’s the pity. Rachel and the Buddhist monk were taking a similar walk down a side street in Kathmandu six months later. She found his teachings paradoxically comforting and shallow. This was what she wanted wasn’t it? Wasn’t this her path? They had been strolling in silence for nearly half and hour when something caught the monk’s attention. He bent over and picked up an object. It was a wallet. The monk opened it and fingered through the Rupee bills. Then he slipped it in his pocket. He looked at her with mild indignation. She realized she’d insulted him, but what he was doing was wrong. Everything she’d ever been taught said if you find something of value another has lost, you need to make every effort to locate the person and return it. Two weeks later, Rachel’s flight was descending toward Tel Aviv. Rabbi Bergman had agreed to meet her there. I wrote this for Tale Weaver #178 – Karma – 5/7/18 hosted at Mindlovemisery’s Menagerie. The idea is to craft a poem, short story, or other creative work on the topic of Karma. I created a fictionalized tale of a young woman who I’d read about some years ago in a Jewish online publication. I can no longer find the original story, so I replicated it here from memory as best I could. Supposedly the essential facts I’ve presented are correct. I’m not trying to denigrate Buddhism, but this is how karma was presented in what I’d read. Perhaps it was Rachel’s “karma” to return to the teachings of her forefathers and remain an observant Jew. James that was a very enjoyable tale. I enjoyed this tale James, karma comes in different guises I find. Thanks for adding your thoughts this week. Choices can be difficult, but it is by them that we learn. Sometimes we move sideways before moving forward. And sometimes we move backward. In Rachel’s case, I’d like to think it was a good move, but then I’m biased since my wife and children are Jewish. Sometimes individuals interpret generalized statements too broadly. I’d like to think that that ‘other teacher’ will get due karma? Some different religions actually do work cohesively. As I mentioned in my afterword, I wasn’t disrespecting Buddhism, but merely replicating a true story I’d read about once. However, within each religion, there are bound to be some people to don’t live up to their stated ideals.